Dr G Holmström, Department of Ophthalmology, Academic Hospital, University of Uppsala, S 751 85 Uppsala, Sweden. BACKGROUND Numerous studies have reported an increased risk of refractive errors in prematurely born infants, but only few have been long term and strictly population based. METHODS A 3.5 year ophthalmological long term follow up of 248 preterm infants was performed. The infants had been included in a previous epidemiological study of retinopathy of prematurity (ROP) (birth weight ⩽ 1500 grams). The incidence of refractive errors and development of refraction were studied, based on retinoscopies at 6 and 30 months of corrected age. RESULTS The overall incidence ofmyopia was 8% at 6 months, of which 35% was transient, and 10% at 30 months. Of the cryotreated infants, 30–40% were myopic at both retinoscopies. The incidence of astigmatism was 52% at 6 months and 26% at 30 months. Astigmatism was associated with ROP, but not with cryotreated ROP itself. Astigmatism “against the rule” was commoner than astigmatism “with the rule”.Anisometropia occurred in 6.5% of the infants at 6 months and in 8.4% at 30 months. The incidence of anisometropia was higher in eyes with ROP, particularly in cryotreated eyes, which tended to have high and persistent anisometropia. CONCLUSION The risk of refractive errors is higher in preterm infants than in infants born at term, and also prematurely born infants without ROP do run an increased risk of having myopia and anisometropia. We recommend follow up examinations with retinoscopy for all infants included in screening programmes for ROP. A population based study on the epidemiology of ROP was previously performed in a well defined geographic area of Sweden.21The aim of the present study was to investigate prospectively the same population with respect to development of refraction and the relation with previous ROP. A population based study on the epidemiology of ROP was performed in the Stockholm area of Sweden from September 1988 to October 1990.21 It included 260 infants with a birth weight of 1500 grams or less who were screened for ROP in the neonatal period. Cryotherapy was performed in ROP stage 3 with confluent fibrovascular proliferations and “plus disease”, but also in the absence of “plus disease”, provided the confluent proliferations involved at least four clock hours in zone II. In the present study retinoscopies were performed by experienced paediatric ophthalmologists at 6 and 30 months of corrected age. 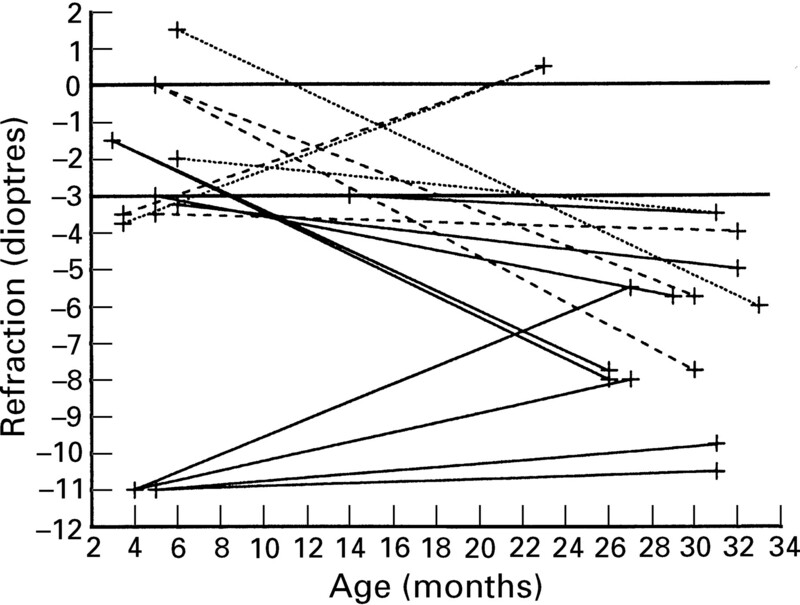 Cycloplegia was induced with eye drops of cyclopentholate hydrochloride (0.5%) and phenylephrine hydrochloride (0.5%) in infants less than 12 months (twice, at 45 and 30 minutes before retinoscopy), and more than that age with a higher doses (0.85% and 1.5%, respectively) (45 minutes before retinoscopy). Hypermetropia of > +3 D (dioptres) was regarded as significant. Myopia was defined as <0 D and was further subdivided into “high” myopia (<−3 D) and “slight” myopia (⩾−3 D and <0 D). Astigmatism was recorded as negative cylinder values. Astigmatism of ⩾1 D and of ⩾2 D were regarded as “significant” and “high”, respectively. The axes of astigmatism (⩾1 D) were divided into three classes—“with the rule” (−cyl at 0–15°, 165–180°), “against the rule” (−cyl at 75–105°), and oblique (−cyl at 16–74°, 106–164°). Anisometropia was defined as the difference in the spherical equivalent between the eyes of at least 1 dioptre. Anisometropia was divided into two groups—“moderate” (⩾1 D and <2 D) and “high” (⩾2 D ). In the present study, major neurological sequelae were grossly defined as “obvious mental retardation, cerebral palsy, and/or epilepsy”. In a comparison between the ROP groups, an unpaired ttest and one way analysis of variance (ANOVA) were used for normally distributed variables. When the overall F ratio in the ANOVA was significant, pairwise comparisons among the means were made by Duncan’s range test. If the variables showed a skewed distribution, the Kruskal–Wallis test was used. Variables measured on a nominal scale were compared with the help of the χ2 test and Fisher’s exact test and, for within group comparisons, we used the paired t test and sign test. Correlations were calculated with Pearson’s product moment correlation coefficient. Relations between various factors and the degree of ROP (no ROP, mild ROP, severe ROP without cryotreatment, severe ROP with cryotreatment), gestational age at birth (24–26, 27–29, 30–32, 33–35 weeks) and birth weight (⩽750, 751–1000, >1000 grams) were evaluated with frequency tables. Two way ANOVA with repeated measurements of one factor was used to compare the ROP groups with respect to changes in spherical equivalents between the first and the second retinoscopies. Stepwise multiple regression analyses were performed to determine how much of the variation in spherical equivalents could be explained by the different risk factors. Stepwise logistic multiple regression analyses were performed to determine the main predicting factors for astigmatism. Of the original population of 260 children who had participated in our earlier prospective epidemiological ROP study,21 seven children had died before first follow up, thus reducing the population to 253 children. A further 22 children dropped out during the present study, resulting in a dropout frequency of 8.7% (22/253). One of these children moved before the 6 month visit, 19 shortly thereafter, and two just before the 42 month visit. Four children were excluded from the study because of diseases unrelated to prematurity affecting their vision. One pair of twins had bilateral optic atrophy due to an undefined metabolic disease, and one child had ichthyosis with severe corneal opacities. The fourth child was lensectomied bilaterally for hereditary congenital cataracts in the neonatal period. At the time of surgery, an anticipated ROP stage 2 was prophylactically treated with cryotherapy. The first retinoscopy was performed in 247 infants at a mean age of 6.1 months (range 2–14 (1.8) months). The second retinoscopy was performed in 228 infants at a mean age of 31 months (range 21–48 (4.2) months). In one infant with complete retinal detachments, no retinoscopies could be performed. The mean values of the spherical equivalents at each retinoscopy in eyes treated with cryo were significantly lower than in untreated ROP eyes, and also compared with the total population of untreated eyes (p<0.01). There was a significant reduction of the spherical equivalent between the first and the second retinoscopies in all subgroups of ROP (no ROP, mild ROP (stages 1, 2), severe ROP without cryo, severe ROP with cryo) but no significant difference in the amount of reduction (two way ANOVA). The spherical equivalent increased slightly with increasing gestational age at birth (r=0.15–0.19, p<0.01) at both retinoscopies and also with increasing birth weight (r=0.12–0.19, p<0.05). Stepwise multiple regression analysis, however, identified cryotreated ROP as the only factor significantly associated with a reduction in the spherical equivalent in each eye on both retinoscopies. Gestational age at birth, birth weight, presence of intraventricular haemorrhage, neurological sequelae, and stage of ROP showed no correlation with the spherical equivalent. Hypermetropia (>+ 3 D) was seen in 13.4% (33/247) of the right eyes and in 12.1% (30/247) of the left eyes at the first retinoscopy and on the second retinoscopy in 4.4% (10/228) and 4.0% (9/227) in the right and left eyes, respectively. No association was found between hypermetropia and the stage of ROP, gestational age at birth or birth weight. Myopia (<0 D) was present in 8.1% (20/247) of right eyes and in 7.7% (19/247) of left eyes at the first retinoscopy and in 10.1% (23/228) versus 9.7% (22/227) in the right and left eyes at the second retinoscopy. The incidence of myopia (<0 D) was higher in eyes with ROP than in eyes without ROP at both retinoscopies (p<0.05). In cryotreated eyes, the frequency of myopia was higher than in untreated eyes (with or without ROP) (p<0.01). Myopia (<0 D) was commonest in infants with the lowest gestational ages (24–26 weeks), and was not found at all in those with the highest gestational ages at birth (33–35 weeks). High myopia (<−3 D) was seen at the first retinoscopy only in infants born before 30 weeks of gestation. Myopia (<0 D) was commoner in infants with the lowest birth weights (⩽750 g) compared with infants with higher birth weights. The frequency of high myopia (<−3 D) was also highest in the group of very low birthweight children (⩽750 g). High myopia (<−3 D) (Fig 1)— Eleven infants (16 eyes) had “high myopia” at either retinoscopy. Six of them (nine eyes) had required cryotherapy. On the first retinoscopy, eight eyes (five cryotreated) were highly myopic. In two of these eyes (one cryotreated), the myopia progressed further, while in both eyes of another infant (not cryotreated), the myopia regressed and changed to a slight hypermetropia. Course of “high” myopia (<−3 D) in 11 infants on first (eight eyes) or second (eight eyes) retinoscopies. Dotted line=eyes without ROP, broken line=eyes with untreated ROP, solid line=eyes with cryotreated ROP. On the second retinoscopy, eight eyes were found to have developed high myopia. Five of these eyes (four cryotreated) were slightly myopic (⩾−3 D and < 0 D) at the first retinoscopy. Slight myopia (⩾−3 D and <0 D) (Figs 2 and3)—“Slight myopia” was present in 26 infants (47 eyes) at either retinoscopy. Nine of them (15 eyes) had been cryotreated. Twenty nine eyes were slightly myopic at the first retinoscopy. In 12 of these eyes (seven cryotreated) the myopia increased (seven increased slightly and five (four cryotreated) became highly myopic). The myopia decreased slightly in six eyes (two cryotreated) and reverted to emmetropia or hypermetropia in 11 eyes (three cryotreated) (Fig 2). Course of “slight” myopia (⩾−3 D) in 16 infants (29 eyes) on first retinoscopy. Dotted line=eyes without ROP, broken line=eyes with untreated ROP, solid line=eyes with cryotreated ROP. Course of refraction in 10 infants (18 eyes) who had developed “slight” myopia (⩾3 D) on second retinoscopy. Dotted line=eyes without ROP, broken line=eyes with untreated ROP, solid line=eyes with cryotreated ROP. An additional 18 eyes (three cryotreated) were found to be emmetropic or hypermetropic at the first retinoscopy, but had become slightly myopic at the second retinoscopy (Fig 3). Thus, a higher frequency of cryotreated (82%, 14/17) than untreated eyes (36%, 10/28) seemed to have developed myopia (<0 D) at an early age—that is, before 6 months of corrected age. In three eyes (not cryotreated) with “high” myopia and 18 eyes (three cryotreated) with “slight myopia”, the myopia had developed between the two retinoscopies (Fig 3). Significant astigmatism (⩾1 D) was present in 51.8% (128/247) of both eyes on the first retinoscopy and was reduced to 28.1% (64/228) and 24.7% (56/227) in the right and left eyes on the second retinoscopy. High astigmatism (⩾2 D) was present in 17.4% (43/247) and 17.8% (44/247) at the first retinoscopy, and at the second retinoscopy in 4.8% (11/228) and 5.3% (12/227) of the right and left eyes, respectively. The reduction in the amount of astigmatism between the two retinoscopies in the total study population was significant, but there were no significant differences between the subgroups of ROP. Astigmatism (⩾1 D) was more frequently found in eyes with ROP than in eyes without ROP at the first retinoscopy (p<0.05). At the second retinoscopy, this association was found only in the right eyes (p<0.05). No significant relation was detected between astigmatism and cryotreated ROP. There were no obvious differences between the frequencies of astigmatism (⩾1 D) in the different gestational age groups at the first retinoscopy. At the second retinoscopy however, astigmatism (⩾1) was less common in eyes of infants born after 32 weeks of gestation (33–35 w) compared with before that age. A general increase in the incidence of astigmatism with decreasing birth weight was observed, being most pronounced regarding astigmatism of ⩾2 D at the second retinoscopy. In a stepwise, logistic multiple regression analysis of astigmatism (⩾1 D) at both retinoscopies, birth weight, gestational age at birth and stage of ROP as well as cryotherapy were included as independent variables. Birth weight was clearly associated with the occurrence of astigmatism. The degree of ROP, as well as cryotreated ROP, was associated with astigmatism only in left eyes at the first retinoscopy. For analysis of the axis of astigmatism (⩾1 D), three classes were compared—“with the rule” (−cyl at 0–15° and at 165–180°), “against the rule” (−cyl at 75–105°), and oblique astigmatism (−cyl at 16–74° and 106–164°). In all subgroups of ROP, except in cryotreated eyes at both retinoscopies, astigmatism “against the rule” (in around 50% in both eyes) was observed more often than any other axis of astigmatism. Astigmatism “against the rule” was also the most frequently observed type of astigmatism in all classes of gestational age and all classes of birth weight, apart from the lowest weight class (⩽750 g), where oblique astigmatism was most frequent. Thus, overall, astigmatism “against the rule” was more frequent than astigmatism “with the rule”. In infants with a very low birth weight (⩽750 g), as well as in infants with cryotreated eyes, oblique astigmatism was the commonest finding. Among the eyes without astigmatism at the first retinoscopy, 16% of the right eyes (17/104) and 13% (13/103) of the left eyes had developed astigmatism at the second retinoscopy. Most (69% right, 88% left eyes) of the astigmatism “with the rule” at the first retinoscopy disappeared at the second retinoscopy. Of the eyes with astigmatism “against the rule”, about 40% (24/64 right and 23/60 left eyes) remained astigmatic and, of these, 83% (20/24 right and 19/23 left) showed no change in axis. Among the eyes with oblique astigmatism, 40% (18/44 right and 18/47 left eyes) remained astigmatic. In 67% (12/18) of the right eyes and in 56% (10/18) of the left eyes, the oblique axis persisted while, in the eyes which had changed axis, astigmatism “against the rule” was frequent. Thus, astigmatism “with the rule” tended to disappear more often than did astigmatism “against the rule” or oblique astigmatism. Most eyes which remained astigmatic did not change axis. No apparent differences in change of axis were found between cryotreated and untreated eyes. However, among the eyes without astigmatism at the first retinoscopy, a higher proportion of cryotreated eyes (63% (5/8) right and 60% (3/5) left) had developed astigmatism at the second retinoscopy compared to the untreated ones (12% (12/96) right and 10% (10/98) left). Anisometropia (⩾1 D difference in spherical equivalent between the eyes) was seen in 6.5% (16/247) of the infants at the first retinoscopy and in 8.4% (19/227) at the second retinoscopy. Anisometropia (⩾1 D) was commoner in infants with ROP (12.4% (12/97) at the first and 13.8% (13/94) at the second retinoscopy) than in those without ROP (2.7% (4/150) and 4.5% (6/133) respectively) (p<0.05). High anisometropia (⩾2 D) was commoner at both retinoscopies in infants with cryotreated eyes compared with in those with untreated eyes (p<0.001). 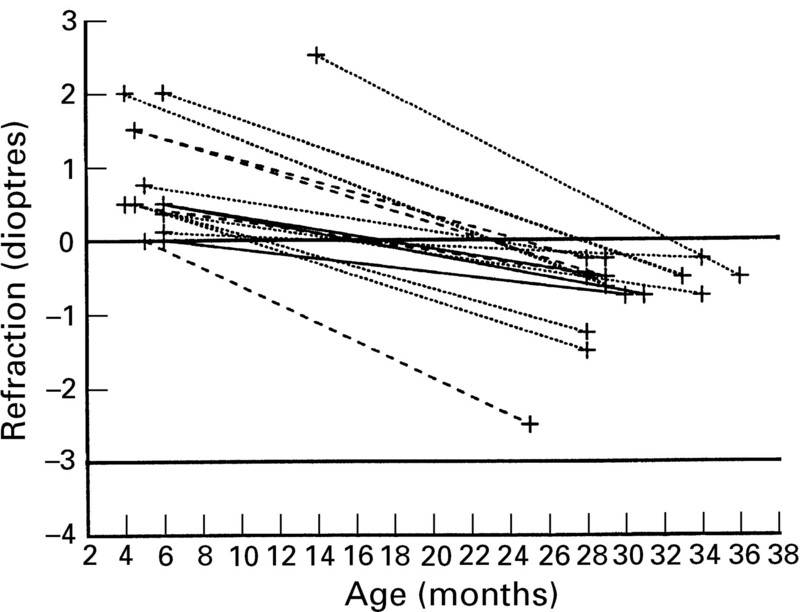 No relation between birth weight and anisometropia was found at either retinoscopy, while high anisometropia (⩾2 D) was commoner in the lowest class of gestational age (24–26 weeks) compared with infants with higher gestational ages at birth. No difference occurred, with respect to the degree of ROP, in the amount of change in anisometropia from the first to the second retinoscopy. Of the infants without anisometropia at the first retinoscopy, 95% (200/211) remained isometropic. In most infants with moderate anisometropia at the first retinoscopy (78%, 7/9) the anisometropia disappeared, whereas most of the infants with high anisometropia (86%, 6/7) remained anisometropic. Five of them had been cryotreated. Thus, there was an association between cryotreated ROP and persistent high anisometropia. Regardless of ROP stage, cryotherapy, gestational age or birth weight, a reduction in the mean values of the spherical equivalents occurred between the first (around 6 months) and the second retinoscopy (around 30 months of corrected age). Cryotherapy seemed to be the principal risk factor affecting the spherical equivalent, according to multiple regression analysis. Myopia was commoner in eyes with ROP, especially in cryotreated ones, compared with eyes without ROP. Myopia was commoner in the more immature infants (that is, with the lowest gestational age and birth weight). The myopia in treated eyes started earlier than in untreated eyes. Transitional myopia was commoner in eyes which had not been cryotreated. Astigmatism was associated with ROP, but not with cryotreated ROP. The incidence of astigmatism increased with decreasing birth weight. Astigmatism “against the rule” was generally commoner than astigmatism “with the rule”. In eyes with ROP, particularly in cryotreated ones, we found an increased incidence of anisometropia, which tended to be persistent and high in the treated eyes. The overall incidence of myopia in our preterm infants, as well as the incidence of myopia in infants without ROP, exceeded that of normal populations in Sweden.7 22 The finding of a higher frequency of myopia among preterms without ROP accords with that of studies by Fledelius23 and Gallo and Lennerstrand,7 but not with a recent study by Pennefatheret al.24 In the latter study, however, conclusions on associations of stage of ROP with refractive errors become difficult since one third of the included infants only had one examination in the neonatal period. Whether stress from the preterm birth itself and/or extrauterine environmental factors affecting the metabolism and growth of the immature peripheral part of the retinal vasculature14 15 may contribute to the development of myopia in eyes without ROP remains to be proved. In the present study myopia was commonest in eyes with ROP, especially in cryotreated eyes which were found to be myopic in 30–40% at both retinoscopies. This finding confirms previous reports of an association of myopia and cryotreated ROP.16 24 25 Whether such an association is explained by the cryotreatment or by the advanced stage of ROP itself remains an unanswered question, but perhaps a randomised prospective study for comparison of cryotreatment in one eye and the recently introduced laser treatment in the other eye of the same infant may further elucidate this. In the present study, the course of myopia at 6 months had usually followed one of three patterns. One pattern (27%, 10/37 eyes) was characterised by persistence of myopia, although a slight reduction could have taken place. A third pattern (38%, 14/37 eyes) consisted of progression of the myopia. Eight of the eyes had been treated with cryosurgery. It seems important to ascertain whether this progression can be ascribed to the cryosurgery itself or to the stage of ROP or a combination of both. At 30 months of age, we found a further 21 eyes (three cryotreated) with myopia. Hence, at this age altogether 45 eyes (17 cryotreated) were myopic. In 18% (3/17 eyes) of the treated eyes compared to 64% (18/28 eyes) of the untreated ones, myopia developed after 6 months of age. This later development of myopia, also reported by Page et al,17 indicates a need of cycloplegic refraction at 2–2½ of age in preterms. Regarding the degree of astigmatism, Laws et al 14 observed an association of high astigmatism with advanced stages of ROP. We confirmed a relation between astigmatism and previous ROP, but not Laws and others’ observation as such, since we detected no significant correlation between astigmatism and our severest ROP stages—that is, cryotreated ROP. Only birth weight was significantly associated with astigmatism in the logistic multiple regression analysis. Astigmatism “against the rule” was far commoner than astigmatism “with the rule” at 6 and 30 months of age, regardless of the presence or stage of ROP, in our population of prematures. This agrees with reports on normal populations by Dobson et al,28 Gwiazda et al,30and Abrahamsson et al,31 but contrasts with Laws et al 14 who reported a predominance of astigmatism “with the rule” in 6 month old preterm infants without ROP and a significant shift towards an “against the rule” axis with increasing stages of ROP. The incidence of anisometropia was rather stable at our two retinoscopies, which accords with previous studies on normal populations.32 33 The overall incidence of anisometropia in our preterm infants (anisometropia ⩾1 D of 8.4% at 30 months) exceeded that of full term populations (1.5% at 92 months,7 1.4% at 4 years22). Further, our incidence (6.5% at 6 months, 8.4% at 30 months) was similar to studies of preterms by Snir et al 11 and Laws et al,14 but lower than in studies of Page et al 17 and Tuppurainen et al,34 which probably reflects disparities in criteria between the different studies. Finally, we found that the incidence as well as the degree of anisometropia seemed to increase with increasing stage of ROP, which agrees with the recent study by Pennefather et al 27 who found the highest correlation with anisometropia (>1 D) in their 2 year old children with cicatricial ROP. Figures are, however, difficult to compare because of different inclusion criteria. The overall frequency of myopia was higher in our population of premature infants than in normal full term populations7 22 and particularly in infants who had received cryotherapy. The frequency of myopia was also higher among infants without ROP than in normal populations. We should point out that the myopia may be transient in every third preterm child, which indicates that a first retinoscopy would be of no great value if performed at too early an age. The incidence of hypermetropia in our study population was similar to that in other studies, including normal populations. Significant astigmatism (⩾1 D) was commoner than in comparable control groups of full term infants. However, the incidence of astigmatism in infants without ROP did not exceed that of infants born at term. We confirmed a relation between astigmatism and ROP, but not with the stage of ROP or with cryotreated ROP itself. As in other studies, we found great variations in the course of astigmatism and in the change of axis, however, without any systematic pattern in the change of axis related to ROP, gestational age at birth or birth weight. The incidence of anisometropia, even in those without ROP, was found to exceed that of full term infants born in the same area.7As in other studies, we also found great individual variations in the anisometropia. The conclusion of our prospective, population based study of prematurely born infants is that preterm infants with a birth weight of 1500 grams or less have an increased risk of refractive errors. When designing ophthalmological follow up programmes of prematurely born infants, one must take into account that infants without ROP may also run an increased risk of developing myopia and anisometropia. We therefore suggest appointments for follow ups, including retinoscopies, of all preterms in every neonatal screening programme for ROP. If the number of examinations depends on financial resources, we recommend that at least one examination be performed of all infants around 12 months of corrected age. If resources are available, a second examination is recommended at 24–30 months of age. Finally, we suggest that the first retinoscopy should not be performed before 6 months of corrected age, in order to exclude most cases of physiological, transient myopia. A second retinoscopy should not be done before the age of 2 years, when the risk of including physiological myopia should no longer exist26 and most of the developmental changes in astigmatism have stabilised. The statistical evaluation was done with the help of Elisabeth Berg, Department of Informatics and Educational Development, Karolinska Institute, Stockholm. The study was supported by the Sigvard and Marianne Bernadotte Research Foundation for Children’s Eye Care, Kronprinsessan Margarethas Arbetsnämnd för Synskadade, Carmen och Bertil Regnérs fond, Margaretha Thyselius fond för blind ungdom, Stiftelsen Samariten, Swedish Society for Medical Research, First of May Flower Annual Campaign, “Förenade Liv” Mutual Group Life Insurance Company, Stockholm, Sweden. (1956) Myopia caused by prematurity. Am J Ophthalmol 41:292–298. (1969) Ophthalmic examination of children of low birth weight. Am J Ophthalmol 67:134–136. Fledelius H. Prematurity and the eye. Thesis. Acta Ophthalmol (Copenhagen) 1976;Suppl 128..
(1980) Refractive power of premature children at infancy and early childhood. Am J Ophthalmol 90:234–238. (1982) Strabismus and amblyopia associated with retinopathy of prematurity. Arch Ophthalmol 100:256–261. (1990) Ocular examination in nine-month-old infants with very low birthweights. Ophthalmic Paediatr Genetics 11:89–94. (1991) A population-based study of ocular abnormalities in premature children aged 5 to 10 years. Am J Ophthalmol 111:539–547. (1993) Very pre-term birth and visual impairment. Acta Ophthalmol (Suppl) 210:63–65. (1983) Ocular morbidity in infants of very low birth weight. Br J Ophthalmol 67:302–305. (1983) Myopia in premature babies with and without retinopathy of prematurity. Br J Ophthalmol 67:170–173. (1988) Visual acuity, strabismus and amblyopia in premature babies with and without retinopathy of prematurity. Ann Ophthalmol 20:256–258. (1989) Prematures with and without regressed retinopathy of prematurity: comparison of long-term (6–10 years) ophthalmological morbidity. J Pediatr Ophthalmol Strabismus Nov/Dec:271–275. (1994) The natural outcome of premature birth and retinopathy status at 1 year. Arch Ophthalmol 112:903–912. (1992) Retinopathy of prematurity: a prospective study. Review at six months. Eye 6:477–483. (1992) Development of myopia in infants with birth weights less than 1251 grams. Ophthalmology 99:329–340. (1993) Follow-up study on premature infants with and without retinopathy of prematurity. Br J Ophthalmol 77:91–94. (1993) Ocular sequelae in premature infants. Pediatrics 92:787–790. (1995) The course of myopia in children with mild retinopathy of prematurity. Vision Res 35:1329–1335. (1991) Visual acuity in infants after vitrectomy for severe retinopathy of prematurity. Ophthalmology 98:5–13. (1988) Incidence of retinopathy of prematurity in New Zealand. Arch Dis Child 63:1083–1086. (1993) A population-based, prospective study of the development of ROP in prematurely born children in the Stockholm area of Sweden. Br J Ophthalmol 77:417–423. (1973) Vision screening of four-year-old children. Acta Paediatr Scand 62:17–27. (1996) Pre-term delivery and subsequent ocular development A 7–10 year follow-up of children screened 1982–84 for ROP. 3. Refraction. Myopia of prematurity. Acta Ophthalmol Scand 74:297–300. (1997) Refractive errors in children born before 32 weeks gestation. Eye 11:736–743. (1993) Multicenter trial of cryotherapy for retinopathy of prematurity 3 1/2-year outcome—structure and function. Arch Ophthalmol 111:339–344. (1995) Myopia of prematurity, clinical patterns. A follow-up of Danish children now aged 3–9 years. Acta Ophthalmol 73:402–406. (1995) Ocular outcome in children born before 32 weeks gestation. Eye 9(Suppl) 26–30. (1984) Cycloplegic refraction of infants and young children:the axis of astigmatism. Invest Ophthalmol Vis Sci 25:83–87. (1980) Infant astigmatism: its disappearance with age. Vision Res 20:891–893. 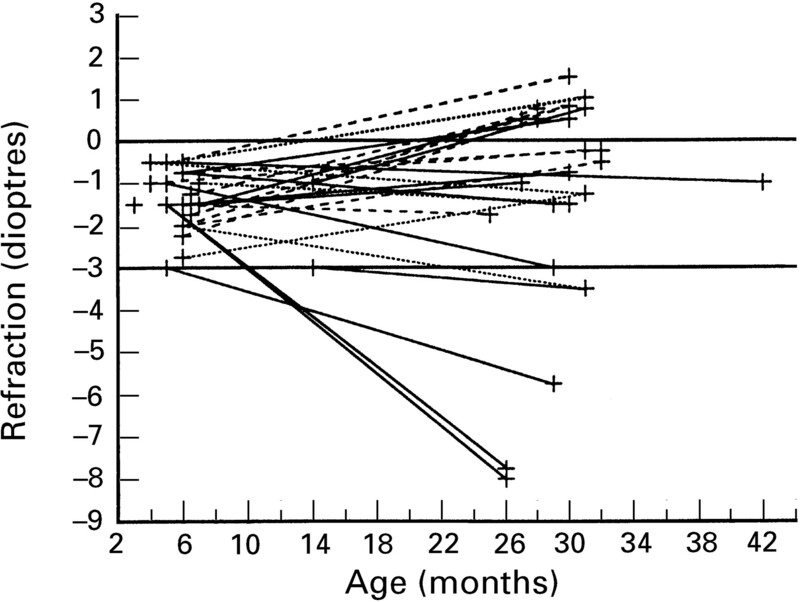 (1984) Astigmatism in children: changes in axis and amount from birth to six years. Invest Ophthalmol Vis Sci 25:88–92. (1988) Changes in astigmatism between the ages of 1 and 4 years: a longitudinal study. Br J Ophthalmol 72:145–149. (1990) A longitudinal study of a population-based sample of astigmatic children. II The changeability of anisometropia. Acta Ophthalmol 68:435–440. (1979) Changes in refraction between the ages of 1 and 3½ years. Br J Ophthalmol 63:339–342. (1993) Ocular findings in prematurely born children at 5 years of age. Graefes Arch Clin Exp Ophthalmol 231:261–266.